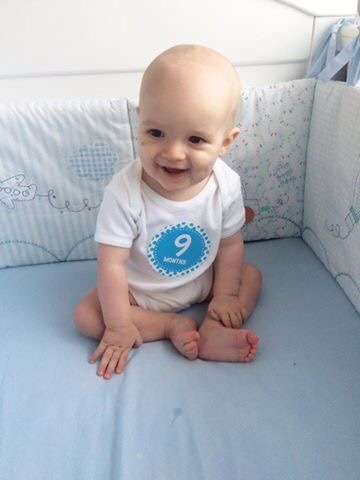 9 months old. Archies has now officially been on this planet longer than he was in my belly. These months just seem to be merging together. I don’t know where the times going. I know I say this every month but time just seems to be flying away. The little chunks is now 19lbs and is eating absolutely everything. He is still having 3 7oz bottles and 3 meals a day. Plus 2 snacks plus scraps from my plate whenever I try to eat around him. He is a little dustbin and wants to eat constantly. Sleeping is still going well although we’ve had a couple of off nights this month where sleep wasn’t on the cards. Generally Archie will sleep 7:30 – 6:00 every night. I started part time work at the beginning of this month. Only 12 hours per week but it feels like an absolute lifetime. Every time I leave Archie I just feel sick. I know he is in the very capable hands of my mum but I just worry he will want me. Archie must have picked up on my nervousness about starting work as he FINALLY said Mama. We haven’t had a very busy month this month. We had a lot of family time, Christmas shopping, oceanarium visits and mummy working. Daddy turned 25 this month so we had a lovely week off with him. Archie is wanting to walk everywhere. He will walk holding onto our fingers or on his own holding onto the edge of the sofa. I don’t think it’ll be long before he is off. Can’t believe this time next month we would have celebrated Archie’s first Christmas already. Bring it on. < Archie: 8 Months Old.